This easy recipe is a healthier version of store bought snack mixes the entire family will love. While many traditional homemade recipes use butter, this recipe uses heart-healthy olive oil instead. 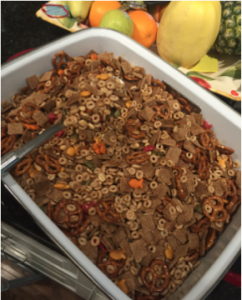 Combine all snack mix items in an extra large baking dish (or several smaller ones). Combine oil and seasonings in a small bowl and drizzle slowly over snack mix, stirring as you go. Preheat oven to 250F and bake at this temperature for 1.5 hours stirring every 15 minutes.